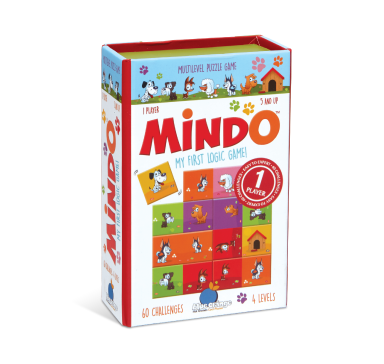 The Mindo Collection consists of 4 clever puzzles; can you collect and master them all? Play solo, or combine them and race your friends. No matter which version you choose the rules are the same: turn and flip the double-sided tiles until you have recreated the color pattern on the challenge card. They only fit one way into a 3x3 or 4x4 grid, so think and plan carefully. 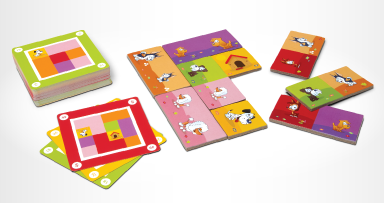 60 different challenge cards and 4 levels of difficulty ensure hours of brain teasing fun! This version is the perfect puzzle for dog and puppy lovers! Correctly connect the 9 tiles to reunite Boxer and his friends.